Our Halloween Night Was A Thriller!!! On Halloween night, we joined our good friends Micheal and Katrina who were nice enough to get us tickets to see "Thriller" performed by Odyssey Dance Theatre. 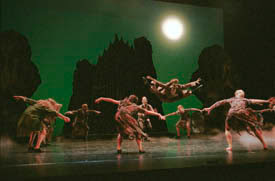 The show was at the Kingsbury Hall at the University of Utah. For those you who have never seen this show I would strongly recommend getting tickets for it next year. Let us know and we will go with you. The dancers were very impressive, the stage lighting and effects were amazing, and most of all it was actually quite funny. To give you an idea, I will tell you about a few of the scenes. Of course, there was the dance sequence from Micheal Jackson's music video. There was a scene where the ballerina from "The Nutcracker" came out to dance to the "Nutcracker Suite", halfway through the number Jason from the "Friday the 13th" series came out and simply shot her to the ground and the audience loved it. One final thing to help you get the idea of what happens at this show, one of the notorious characters in the show was Lorena Bobbitt, the lady who cut off her husbands manhood back in 1993. Unfortunately we missed the invite to carve pumkins with the Phillips, Ralls, Veticas, and the Richards. But we did make sure to get some pumpkins on the porch. We couldn't find a pumpkin carving book and kit this close to Halloween, so we had to do it from scratch with kitchen knifes. It helped us to realize just how nice those little cheap tools you get in the kit really are. Yes we went on our first cruise ever!! We went to Mexico. We left 10-19 and came back on 10-25. It was so nice not to have to do anything. Our bed was made when we came back from breakfast and then it was turned down when we came back from dinner. And in cruise tradition, there was some animals made out of towels. Our cabin was kinda small. We didn't have a port hole to look out of, but don't worry they put a fake window in so it would seem like we weren't in that small of a room. We had two beds in the cabin, Kelly wanted to push them together, but to be honest it was nice to have my own bed. Sorry Kell. We went with Carnival, "the fun ship", and our ship was called the Elation. We went with some friends Kelly grew up with, Josh Cragun and his wife Jessica. Then some other people from Morgan were there as well. We all sat at the same table. Our stops were Cabo San Lucas, La Paz and Encenada. It just kept getting dirtier each city we visited. Encenada was the worst. People would just send their kids to beg and they wanted you to buy their chicklets. One kid would not get out of my way and he even put his hand up to stop me. We went kayaking in Cabo and saw some pretty cool rock cliffs and I went snorkeling for the first time. La Paz was kinda lame so we just went to the beach. It was really windy there because of tropical storm Kiko. We were worried that it would turn in to a hurricane, but we were lucky. We saw this little pufferfish roll up on the beach with the tide. I felt bad for it so I made Kelly throw it back into the ocean. But come to find out from other people, there was pufferfish rolling up on the sand all over the beach, so our fish we tried to save probably just died anyways. Then in Encenada everyone said to go see the blowhole, or the natural phenomenon as they call it down there. It really blowed. It wasn't cool at all. Plus we had to walk past all these merchants who practically pull you into their shops. We didn't really want any of their cheap crap, except Kelly wanted a soccer jersey, but we never found one. Then the city of Encenada was just lame. Same old stuff we saw in the other cities. But it was just a cool experience to see another country and be able to appreciate all that we have. Now I understand why they want to come to our country. Plus the tour guide to the blowhole told us that minimum wage there was 55 cents. So be glad if you are making more than that. Over all it was just a good experience and now that we can cross a cruise off our list, we can start having kids. Ha just kidding, that won't be for awhile. If you haven't done a cruise I recommend it. Maybe next time we will do a Carribean or an Alaskan cruise. Well thanks for reading this hole thing, so enjoy the pictures and what not.